A tragedy struck last month when former Clemson players Milena Stanoycheva and Anna Dolinska were killed in a plane crash. Also perishing in the plane were Milena's fiance, Glenn Howle, his father, Jerry, and her best friend Anna. Baylor's Benedikt Dorsh and Stanford's Amber Liu were named ITA National Players of the Year. 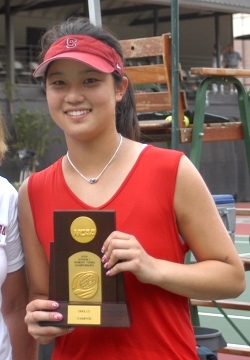 It was the second year in a row for Amber, who also was honored with the Honda Award for tennis. Another winner for the second straight year is the Rice doubles team of Richard & William Barker. Lauren Barnikow & Erin Burdette of Stanford were the women's doubles winners of the award. The DePaul women's and Pepperdine men were the May recipients of the ITA National Team Sportsmanship Award. Princeton has named former Duke standout Kathy Sell as the new women's coach. Kathy will replace the retiring Louise Gengler in the fall. The 2004 ITA National Small College Championships will be held at Florida Gulf Coast University in Fort Meyers. The dates for this year's event are October 14-17. The University of Texas-Arlington swept the singles titles at the USTA National Collegiate Wheelchair Championships. Danny Fik and Sarah Casteel were the UTA winners. In doubles, Kevin Green and Russell Rodriguez of Middle Tennessee were in the winners circle with Nicole Saltzberg and Kiersten Mohr of Arizona.